I seriously need to learn photoshop! That is a great picture. Your family is beautiful. Love the little Landon's announcement too! What a doll. Wow, the picture looks great! 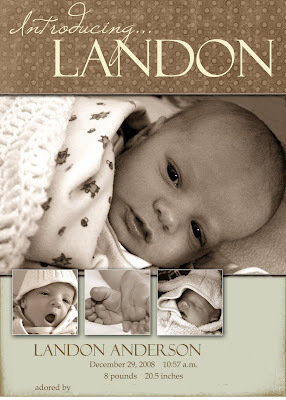 I especially love little Landon's pictures on the birth announcement. How precious! What great pictures! 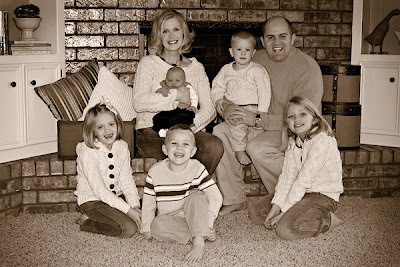 Very cute announcement...and great family photo...and you look phenomenal for having such a new baby! Your family photo looks great! Landon's announcement is beautiful. I love black and white photos. shandy is great, and your announcement is adorable. sometime you should try www.picnik.com it's a FREE photo editing website. it's EASY to use and gives you adorable pics. i LOVE it. cute, cute baby. Isn't photoshop AMAZING! Wish I had it & knew how to work it! Your little Landon is Precious!! Your whole family is adorable! Shandy really is an amazing girl! WOW! That's amazing! The family photo is beautiful, and so is the SWEET announcement! 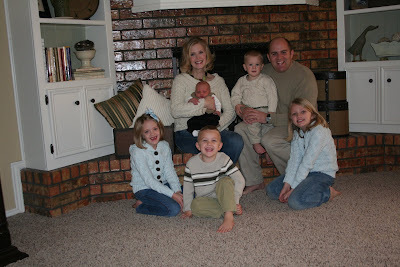 What a cute family picture - she sure did weave some magic! And the birth announcement is so sweet. I hope you are enjoying this magical time! Melissa you look fabulous and have such a cute family. The birth announcements look great. Your announcement turned out so lovely! Your family is gorgeous! Thanks for her info! Definately worth saving and definately worth the $8!!! Beautiful family, pic and photoshop edit! the photo and announcement arrived and look beautiful! you and Hyrum sure know how to make C.U.T.E. kids!! Beautiful family pictures and such a sweet little boy! !